Wildlife conservation is a global concern as species and their habitats face an increasing number of threats, many of which are caused by human activities. The WWCT co-ordinates seven regional conservation programmes in the UK and overseas, all of which are funded by our zoos and in many cases, supported operationally by zoo and trust staff. Our interactive map below shows the areas in which we work. WWCT has chosen our own region, the south west of England, as one of its Regional Conservation Programmes due its diverse range of habitats, providing strongholds for several declining UK species. WWCT has chosen Vietnam as one of its Regional Conservation Programmes due to the desperate need to address the threats facing much of the country's wildlife and the existing commitment to the region by the staff of Newquay Zoo. WWCT has selected Sulawesi as one of its Regional Conservation Programmes due to the area's extraordinary biodiversity and because the captive breeding programme for the Critically Endangered Sulawesi crested black macaque is managed by Paignton Zoo. WWCT has selected western Zimbabwe as one of its Regional Conservation Prgrammes because Paignton Zoo and the WWCT have been supporting the Dambari Wildlife Trust ( DWT), based near Bulawayo, Zimbabwe since 1997. WWCT has selected south-western Nigeria as one of its Regional Conservation Programmes because Paignton Zoo has a long history of support for conservation education in the Omo forest. WWCT has selected Highland East Africa, and the Udzungwa Mountains in particular, as a Regional Conservation Programme due to the presence of a small community of inspiring international and Tanzanian researchers working on conservation issues in the area. WWCT has chosen Coastal East Africa as one of its Regional Conservation Programmes because of its highly threatened biodiversity and due to a history of support to partners in Kenya for survey work mostly focusing on the Critically Endangered small antelope Aders' duiker. Animals and habitats are at particular risk from land development leading to habitat destruction, poaching and the illegal wildlife trade, pollution, competition from non-native species and the effects of climate change. 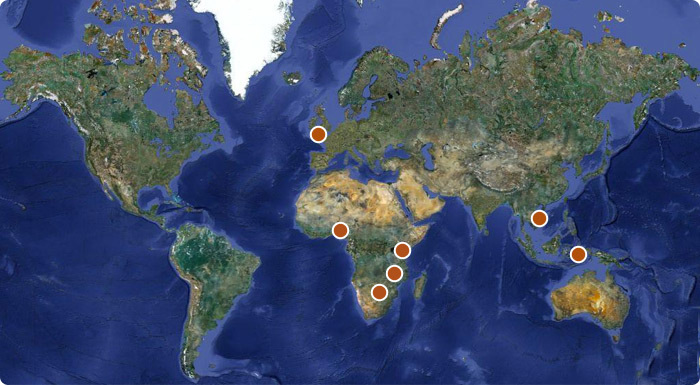 The WWCT also supports a small number of projects outside of the regions listed where there is a clear link with the work we do within the zoos.